Unbelievable - how on earth did two of the hottest tickets in town, Arctic Monkeys and The Rural Alberta Advantage, came into town and basically played next door to each other at First Avenue and 7th Street Entry? For those outside of Minneapolis, First Ave and 7th Street are basically one big building. The mainfloor (First Ave) is definitely much larger than 7th Street, which is pretty much like a closet. So with some strategy, I was able to catch four bands last night at both sold-out shows, weaving in and out of bodies and having a pretty good time about it too. Opening up for Arctic Monkeys are an all-girls group The Like (myspace), which probably didn't fit too well with the "rock n roll" styling of the Arctic Monkeys. I'm not sure if the audience "liked" them, but I thought they were pretty good. They reminded me of 80s girl group, like the Go-Gos. They obviously must love Duran Duran as they ended their set with a song referencing "Hungry Like a Wolf". Also, they were all cute, especially with the wardrobe (I later spied that singer Z Berg owns a Hello Kitty purse). I was impressed with them enough to check out a free download of "Fair Game" from Work It Media. I headed over to 7th Street to catch The Love Language (myspace), who Kate II saw a few months ago. She described the band as a "six-member troop hailing from Raleigh, North Carolina". Well, guess what? They've gained another band member along the way, they are now seven people on the very tiny, tiny 7th Street stage. Between the two keyboardists, three guitars, one bass, one drum, they often explode with very loud melodies ... so loud that maybe it blew out one of their amp - which was quickly replaced for their last three songs on their set. Headed back to see Arctic Monkeys (official / myspace). The last time I saw these guys, I noted that singer/guitarist Alex Turner didn't do much on stage (he just plays and sings). But it didn't matter, because the audience loved it. There were a few songs that sent the audience into apemode, particularly "I Bet You Look Good on the Dancefloor", and their new one, "Crying Lightning". 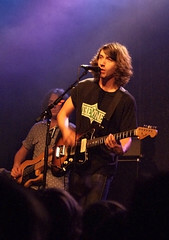 What's changed is that Turner grew out his hair (in fact, the rest of the band seems to all have shaggy-like hair), he's actually doing more on stage like dancing and shaking in his Vines T-Shirt. He still looks youthful, but it's definitely not "I'm new at this rock thing" clean-cut look from last year. What hasn't changed is the fact that their audience STILL INTENSELY LOVES this band. Every song is sung by a sea of eager fans, every word is clung on like dear life - it's as if they were a military, awaiting orders from the Monkeys. 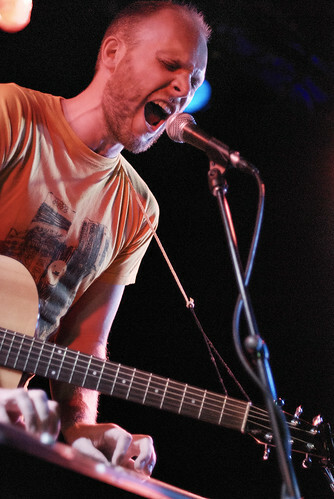 Compared to the massive youth crowd of the 800lb Monkey, The Rural Alberta Advantage (official / myspace) is tamer. Their audience is a little older (beards, button shirts, beer-drinkers) and I was impressed at how many people knew the RAA songs, as I was told by Kyle that when the RAA came here a few months ago that it was only half-full. Being a cover lover, I was obviously keen on the "S.O.S." (Abba) and "Eye of the Tiger" (Survivor) covers. The audience seem to really dig "The Dethbridge in Lethbridge". As for the encore, they didn't really leave the stage. Instead, on the last song, all three band members went into the audience and started singing "Goodnight". At first, without a mic, it was hard to hear singer Paul Banwatt, but as the audience shush to hear the vocals - it was pretty intimate. I suppose that they usually end their set this way (especially with loads of people), as they seem to know what they were doing when the final song came on. So as 'man on the scene', both are fine bands, but both also cater to very different audiences. If you get a chance to see either band, they're definitely worth seeing, if you don't mind that they are both somewhat popular. PS, no photographs, due to lack of a photo pass - but enjoy this rare vu-art instead. Update 9/27/09 12:34 pm: Added two photographs.